From the outset, it was clear that this week's summons of the Chilean bishops to Rome for emergency talks on the country's abuse crisis would be unlike any prior Vatican push to address the scandals... and a day after its close, the summit has indeed produced a sweeping, landmark outcome: at a midday press conference in Rome, the secretary-general of the country's bishops announced that the entire 33-man bench – the heads of 27 dioceses and six auxiliary bishops – had placed their resignations "in writing, in the hands of the Pope, that he might freely decide with respect to each one of us." 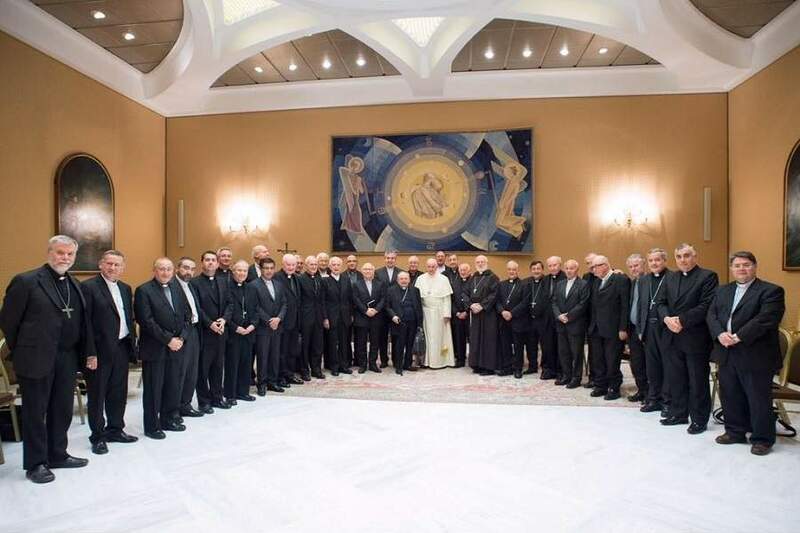 The letters delivered at yesterday's end of the three-day retreat, the pontiff has not announced any immediate acceptances of the walking papers, which would be required for them to take force, and without which the prelates remain in full possession of their respective offices. It is unclear whether the move was demanded by Papa Bergoglio in the course of the meeting. In this extraordinary scenario, it is to be expected that the broad indictment of Chilean Catholicism's leadership class – which has extended to the current Nuncio, Archbishop Ivo Scapolo – would see any current crop of files for potential appointees tossed out and compiled from scratch, an overhaul most likely to occur under a new Nuncio – a figure with a fresh set of eyes, untainted by the years-long storm in which no less than Francis himself had become perilously entangled. Along those lines, it's notable that, according to one Chilean report on the eve of the talks, a petition submitted to Rome by some participants in the recent local investigation conducted by Archbishop Charles Scicluna of Malta has presented a very specific name for Scapolo's replacement: Fr Jordi Bertomeu, the CDF staffer who assisted with the probe – and temporarily led it after Scicluna was rushed to a hospital with a gallbladder attack shortly after his arrival. A 49 year-old Catalonian, Bertomeu is said to have garnered high marks from those interviewed for his sensitivity, openness and candor in hearing out the suffering of victims and the wider church impacted by the turmoil. Alongside Scicluna, Bertomeu took part in yesterday's final session of the closed-door talks. 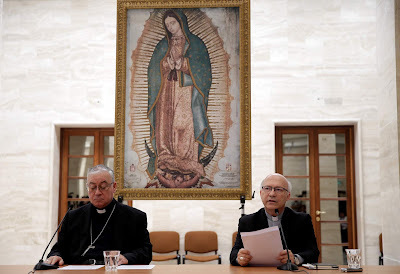 All that said, in the country's most prominent posts, today's group act is purely symbolic: the heads of Chile's two largest dioceses – Santiago and Valparaiso – are already past the retirement age of 75 and had submitted their letters at that point, as has the head of another of the bench's four archdioceses. On another critical front, the move doesn't include the capital's already-retired Cardinal Francisco Javier Errazuriz Ossa, now 84. Long accused of playing a major role in the cover-up for Chile's most notorious predator, Fernando Karadima, Errazuriz's ongoing membership in Francis "Gang of Nine" lead advisers has drawn the most potent scorn from survivors and their advocates. While Francis could have unilaterally forced any and all the prelates from office without having their resignations in hand, the bishops' offer to depart en bloc paves the way to an epochal makeover of a national hierarchy of a kind unseen over the church's long trail of abuse scandals. Today's stunning announcement came in tandem with a leak of the 10-page reflection the Pope delivered to the prelates at the summit's opening. 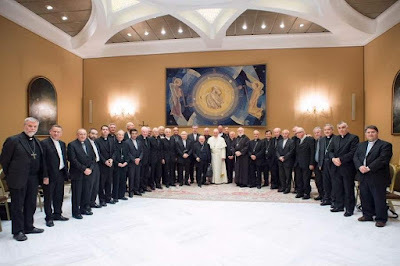 The text obtained (en español) by the Chilean TV outlet TeleTrece/T13, in a stringent upbraiding of their general conduct, Francis told the bishops that their style of governing had seen the church commit the "sin of becoming the center of attention" as opposed to "signaling and announcing" Jesus to the world around it – a shift, he said, born from a "loss of prophetic strength." "The problems you live today within the ecclesial community," the Pope wrote, "will not be solved solely by taking the concrete cases and reducing them to the removal of persons; this – and let me say it clearly – will have to be done, but it is not sufficient, there is more of a ways to go. "It would be irresponsible on our part to not deepen our search for the roots and structures which enabled these concrete events to happen and perpetuate themselves." Looking to the future, Francis sketched a vision of "a church capable to put what's important at its center: serving the Lord in the hungry, the prisoner, the thirsty, the homeless, the naked, the sick, in the abused" – a citation of his beloved Matthew 25, the Last Judgment – "with the[ir] awareness that they have the dignity to sit at our table, to feel themselves 'at home' among us, to be considered family. "This is the sign of a church which has been wounded by its sin, given mercy by its Lord, and become converted in prophecy by its vocation." Again, however, who will lead that conversion – and the full shape it will take – is anything but a solution coming overnight.